Harveys was a department store chain best known for its original store in downtown Nashville, Tennessee. The original Harveys department store was opened by Fred Harvey in 1942 at the corner of 6th Avenue North and Church Street. The site was the former home of a post-Reconstruction Nashville retailer, Lebeck Brothers/Denton & Company, which rose to prominence in the 1870s. When the Lebeck Brothers property became available due to the store's closing, Fred Harvey founded Harveys department store on the property. The store expanded to eventually cover the entire block of Church Street from 6th Avenue to 5th Avenue. The store brought the first escalators to middle Tennessee and the decor featured several carousel horses which had been salvaged from Glendale Park, a local amusement park that closed during the Great Depression. The store was also known for its lavish Christmas decorations as well as the annual nativity scene it sponsored in Centennial Park. In 1960, Harveys, along with several other downtown Nashville stores, was the site of sit-in demonstrations, in which local college students protested against racially segregated lunch-counters. Harveys officially desegregated its lunch-counters on May 10, 1960. After two decades of successful growth at its downtown location, Harveys expanded to other locations. 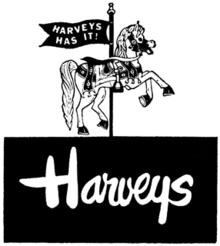 Harveys opened suburban branch stores at Madison Square Shopping Center (1962) and 100 Oaks Shopping Center (1967). Stores were also opened in surrounding middle Tennessee cities, including Clarksville, Columbia, Cookeville, and Murfreesboro, Tennessee, as well as Madisonville and Hopkinsville, Kentucky. One west Tennessee store was also opened in Dyersburg. By the 1980s, however, the popularity of suburban shopping malls led to declining sales at Harveys downtown Nashville location. The original store was closed in January 1984 and torn down to make way for a parking lot. In the late 1980s, Harveys announced another suburban Nashville store at 4724 Lebanon Road in Hermitage. Prior to the opening, the chain of stores was sold to Virginia-based Peebles in 1988. 1 2 Thompson, E. D. (2003). Nashville Nostalgia. pp. 133–136. ISBN 0-9744322-3-7. ↑ Moriarty, Megan (January 26, 2006). "Zoo, casino lured Nashvillians to 'country'". The Tennessean. ↑ Paine, Anne (December 4, 2003). "Competition has downtown in a decorating fever". The Tennessean. ↑ "Workmen Installing Harveys' Monument To First Christmas". Nashville Banner. November 18, 1959. p. 16. ↑ "60 New Arrests Mark Bomb Threat". The Tennessean. March 3, 1960. ↑ Wynn, Linda T. (Spring 1991). "The Dawning of a New Day: The Nashville Sit-Ins, February 13, 1960–May 10, 1960". Tennessee Historical Quarterly: 52. 1 2 Fontenay, Charles L. (December 4, 1983). "The Innovator Departs". The Tennessean. ↑ Battle, Bob (January 30, 1984). "Harveys puts urban horses out to pasture". Nashville Banner.